As England are once again eliminated from the Euros, different people have their own unique reactions – and it’s usually one of the following; disappointment, anger or glee (usually that’s the soap opera obsessives who just want the footy to be over as soon as it begins). However you feel though, it isn’t unusual to reflect upon what might have been – could we have broken out from a rigid 4-2-4? Maybe we should have gone for the opposition rather than sat back and waited? Or even deployed different players in our starting line-up. Theo Walcott caught the attention of the nation with one sublime goal and one assist during his small window of opportunity to represent his country. The following is an interview we conducted with him a couple of years ago. 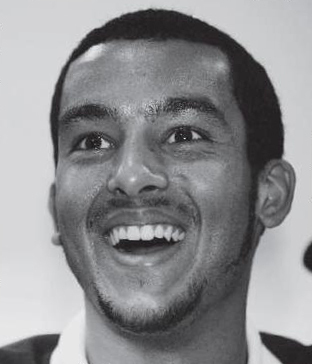 Theo Walcott’s just your average 19 year old – he comes from Newbury, still lives with his Mum and Dad, drives a VW golf and supports Liverpool. He also plays for Arsenal and England, has a girlfriend who has appeared on the cover of ‘Hello’ and when he was transferred three years ago became the most expensive 16 year old in the history of the English game. He was even due to have a walk on part in “Harry Potter and the Order of the Phoenix” but was too busy with his day job! Theo’s driving theory test wasn’t exactly normal either. OK, so he filled in his questions and passed first time. Nothing unusual about that you might say, but the fun began when he finished and picked up his mobile. Whilst Theo was sweating over his stopping distances, it had been announced that he was in the England squad for the World Cup in Germany. Quite a shock especially as he had never even played in the Premiership. Obviously if you’re part of the England set up, and making a few quid from your Premiership wages then surely you go down the Beckham route and stuff your sizeable garage full of top notch Ferraris, Porsches and Aston Martins. So what did England’s young hero go for? This season Theo has changed squad numbers to wear the famous number 14 previously filled by Thierry Henry. So it’s just as well that he’s a down to earth calm guy who’s unaffected by superstar status. But surely having wild eyed defenders trying to kick 6 bells out of him has made him a more aggressive person. Is he an aggressive driver? So why does he think that so many guys his age crash their cars? Have thoughts on the interview? Give us your opinion in the comment section below!